Shortly before Universal Pictures disbanded its "B" unit, the studio inaugurated an energetic western series starring Rod Cameron. 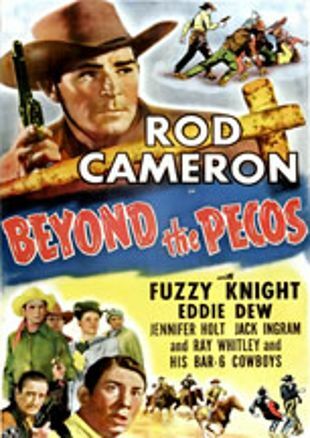 In Beyond the Pecos, Cameron plays a rancher at odds with longtime rival Eddie Dew (himself a "B" sagebrush star at other studios). The two brawny men in Stetsons battle over rights of oil land that borders both their properties. When they tire of squabbling over money, Cameron and Dew fight over the attentions of pretty Jennifer Holt (daughter of Jack Holt). Director Lambert Hillyer handles Beyond the Pecos with his customary speed and efficiency.